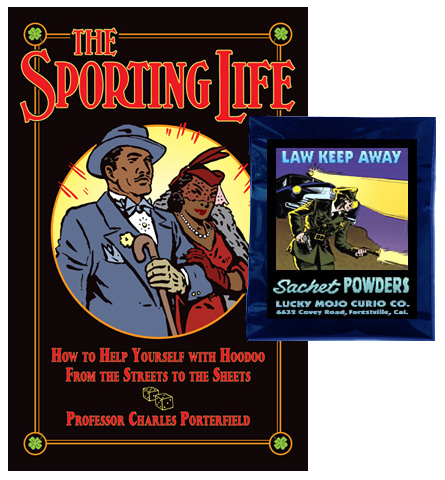 The Lucky Mojo Curio Co. is happy to announce the publication of a brand-new book by Professor Charles Porterfield, the host of "The Now You Know Show." This is a 96 page book. Well, this looks really good. I believe I will be getting a copy. Can we see the table of contents for this book? Wow thanks. I feel so naughty. I really want this book. Put me down for a copy. Sounds great! I know it's a bit cheeky but I'm so excited about this book; Is there any way of getting an early copy? I think the earliest that you get the newest books is at the worshop in May. You can PRE-ORDER the book now (press the blue button) and we will ship your copy as soon as we his the release date! Due to new credit card regulations, we can not rerun the same card. Please contact us with an alternate form of payment, and we will be glad to fill your order promptly. This has happened to me every time I've tried to make a purchase directly from the lucky mojo store. I did speak with Nikki some months back to try and find out what the problem was and although she was very attentive in trying to find a solution, there wasn't much that could be done other than me phoning my bank up to which they confirmed there was no issue with my debit card on their end. I do live in the uk but I can't see why that would be an issue as I followed all the steps for making foreign orders. Thankfully I've been able to purchase several of the great books you have published via Amazon so may I ask if the sporting life will also be sold on their too? I am sorry you are having this address-matching problem. It does happen with some -- but not all -- foreign orders, due to the different ways that the banks record the addresses versus the ways that people enter the addresses into our system. If you are a regular customer, we will run your credit card on our terminal, but we do not do this for new customers, of course, as we have no protection against people using stolen cads from foreign nations. We do sell all of our books via Amazon, and also via many other occult book shops -- and we sell wholesale as well as retail, so if you can convince a UK shop to stock all or part of our line, that would be a way for them to make some money and you would be supporting a local brick-and-mortar shop as well. Learn more about the sporting life from the author and editor now! The book, and the more than 150 spells it contains, are being discussed on the Lucky Mojo Hoodoo Rootwork Hour today!! The Lucky Mojo Hoodoo Rootwork Hour will be on the air!! At 3pm PT, 6pm ET, catherine yronwode, ConjureMan Ali, and special guest Professor Porterfield of AIRR will provide 90 minutes of free readings, free spells, and conjure consultation, giving listeners an education in African American folk magic. 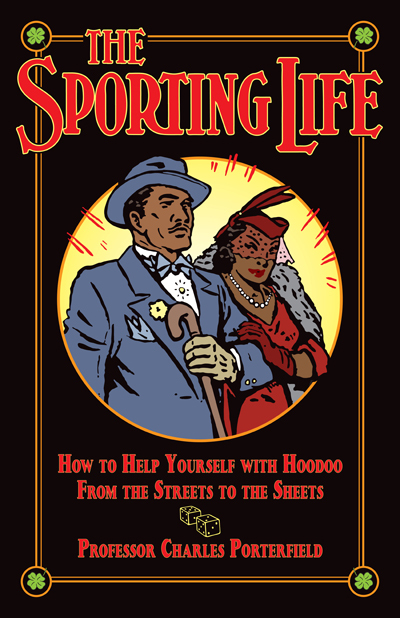 We begin this show with a Discussion Panel focussed on the topic of "The Sporting Life: How to Help Yourself with Hoodoo from the Streets to the Sheets." Even though I have recently become a regular buyer of lucky mojo published books I currently own 2 and am awaiting the delivery of 3 more to arrive from Amazon, I do understand and respect the policy you have in place to safeguard yourself as well as potential victims of theft. So I'll keep my eyes peeled to see when Amazon has this much anticipated book in stock. Because of the U.K. Debit card address issues I had with the lucky mojo site I've brought the book from Amazon but it does not ship until June 16-27, may I ask if this is likely to change to an earlier date? We do not control Amazon distribution. We announced to them that the book was ready for shipping from our shop in early May, and they placed the title on their site, but they did not actually order copies from us immediately. They typically wait until they have several orders in hand before they order a book. Their order just came in and the books are shopping to them tomorrow. When they receive copies, they will re-ship to you. Again, this is typical of Amazon's handling of a NEW product. Once they have established a track-record for the title, based on monthly sales, they will re-order in such a way as to not run out. I really do not know why, if they receive the books from us before May 31 -- which they will -- they should hold them until June 16 - 27 for shipping to you, but that is part of their mysterious and wonderful reality, not part of ours. Hello all. I hope that all of you have gotten a copy of The Sporting Life have been enjoying it and finding it of good use. If you have any questions just let me know and I'll be happy to answer them as best as I can. I just got this book from Amazon; since I have Amazon Prime, it arrived in two days. Very interesting read. Always enjoy reading about outlaws and those outside of society's norms. I am so glad you are enjoying the book. I hope you find it of good use to you and all your works. Thanks for this book. I saw that you are giving away copies on Facebook. If I do not win one, I think I will buy a copy. Yes, it is true, 5 copies of "The Sporting Life," plus 5 packets of Law Keep Away Sachet Powders are being offered as prizes in our weekly Facebook Fridays fiveaway for October 14th, 2016. There is an error on page 57. The prayer I use for winning slots is from Job 20:15, not Job 20:18. But thanks for including it. Thank you Mama Micki. Please contact Charles directly so that this can be fixed in the next printing of the book. 1. on page 32- is there an alternative substitution for female for mojo for respect, success and protection? 2. on page 92 -paper to force someone to do as Iyou say - how many time do I write the name of the target on the brown paper? Do I fold the paper toward me then turn it clockwise and fold it some more? I'm sorry but I don't know how to answer your first question as I do not have the book handy at the moment. If you are crafting a petition to control someone, I like to write their name nine times. Yes, you can fold it to yourself, as you are drawing them in under your command. Fold a total of three times. 1. Anytime a woman sees a mojo that uses John the Conqueror Root, she can substitute Queen Elizabeth root, or go ahead and use John the Conqueror. Your choice! 2. The person who told the spell to Harry Hyatt (as quoted in the book) just said, "write the name out" and there was absolutely no mention of folding, turning, or anything of that nature. To "write someone's name out" is one time. No folding needed. I mean, nothing is stopping you from writing it multiple times, but It is a paper-in-the-shoe spell, so a flat paper is easiest to walk on. By the way, i am not trying to sell you anything, but you might get some more tips on petition papers and shoe magic from my book "Paper in My Shoe." Thank you Miss Athena and Miss Cat for taking the time to response to my questions. Miss Cat, I am so very grateful to have found lucky mojo co products, your Sunday radio show and the forum. I used to feel like a victim of circumstances. Nowadays, I would take charged of situations by doing the rootworks I learned from the various sources that affiliate with Lucky Mojo Co. The results I have with these works definitely altered my life for the better. Thanks for the kind words. I am glad to know that we are helping you.